Neuroplasticity and e-stim are familiar terms to anyone who has gone through stroke rehab. But how and why they work remains a mystery to those of us who are not neurobiologists. Neuroplasticity – this is a complex term for the natural learning process. During our lives we all have the experience of learning and forgetting. We memorize a list of presidents for a history exam. Months later we have forgotten some or the entire list. This is because the brain is continually building and loosing the connections it needs to function. When we study we activate certain memory cells to connect in unique ways. Over time the brain cells (neurons) that ‘remember’ the names are activated over and over again through electrical impulses. These impulses cause the cell body or nucleus to manufacture and place certain proteins in the membranes that ‘cement’ the pathways between the cells, creating memories. Continual activation binds the cells more closely and allows us to remember what we have studied. But brain cells are living units that grow, change and adapt over time. When the list of presidents’ names is not reinforced over time these protein connections are lost along with the memories. The proteins that were made to build the intercellular links degrade and are not replaced. Over time you will probably loose the memory of the president’s names because you do not continually reinforce the information but you will keep the memory of your children’s names because you use this information every day and these critical intercellular links and memories are continually renewed. Neurons in the brain consist of a cell body where the cell manufactures the proteins that make up the neuron, an axon that sends information to other neurons and thousands of dendrites that receive information from other cells via electrical impulses and chemical transmitters. 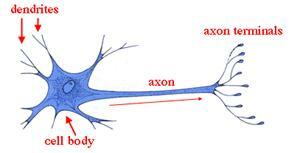 A neuron sends a message via electrical impulse through its axon to other neurons based on the impulses it receives from other cells through its dendrites. 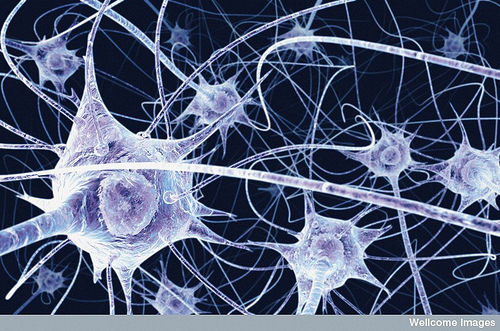 In this way each neuron decides what impulses to pass on to other neurons. A typical neuron is pictured below. The dendrite will respond to electrical and chemical signals from other nearby neurons by growing tiny spines in the direction of the impulse and by inserting special proteins in the spine membranes that link it to the sender axons. The longer and more frequently these cells send and receive impulses the stronger and more enduring the link. We know that sustained electrical activity is what prompts the brain to rewire itself so it seems logical that artificially applied electrical stimulus from e- stim devices will aid and speed brain circuit recovery. E-stim is applied in various ways to encourage stroke recovery. An e-stim device will often be applied directly to a muscle and in order to activate the neurons that control that muscle. Over time continued electrical stimulation may help to reestablish a pathway for muscle control. In my own example application of electrical stimulation across my shoulder after a stroke helped to reestablish the neural path and alleviate the subluxation that existed As expected, this process took several months. Other experimental devices are being developed that apply very weak electrical fields directly to critical brain regions during rehab therapy. These help encourage the establishment of the new neuronal pathways already discussed. In one study wires carrying a weak electrical current are placed across the brain area that controls muscle movement, the motor cortex, during rehab sessions in order t supplement the natural neuron growth previously described. E-stim supplements the internal electrical and growth processes that already exist in the brain. This information should help the non scientist to understand the mysterious terms neuroplasticity along with how and why e-stim is believed to work in the stroke rehab process.